Organizations hold many different types of meetings, which, depending on their objective and purpose, result in different expectations and procedures. For example, we distinguish between information meetings and decision meetings or between problem-solving and brainstorming meetings. The following 8 tips are applicable to all meeting formats. Tip 1: Draw up an agenda whereby you determine the points to be addressed. Delete the agenda item “Other” and instead consider concrete topics that are especially important and urgent. Tip 2: Optimize the group of participants. Consider which decision-makers, staff and experts you need to achieve the objectives of the meeting. 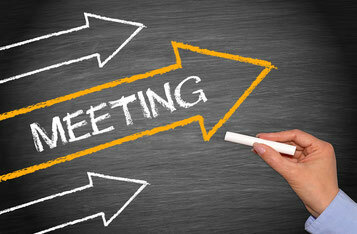 Tip 3: Send the meeting invitation and agenda to the participants in a timely manner. If necessary, supplement these with any supporting materials required for preparation. Tip 4: Begin with a warm-up. This allows the participants to settle in and get attuned to the topic and to the other people. Tip 5: Clearly lead the meeting through the agenda items. Foster discussion among the participants and be mindful of the rules for good communication. Tip 6: Finish on time. To do so, allow sufficient time to summarize the results of the meeting and agree on any further tasks and approaches. Tip 7: Write a synopsis of the minutes and important decisions. Send this protocol to all participants. Tip 8: Evaluate the meeting according to predetermined criteria. How was the interaction between the participants? Were you able to cover all the points on the agenda and keep to the schedule? What could be improved? Contact me for additional tips and techniques for holding successful meetings. My customized training sessions delve into the different types of meetings, the rules for effective communication and instruments for visualization.